The WaterRower range is arguably one of the most aesthetically pleasing collections of fitness equipment that has been produced to date. But we want to know; Is it a case of style over substance? To find out we've carried out our most recent product test on the WaterRower Natural S4 rowing machine. To start with, the Natural frame is solid ash wood with a honey oak stain giving the machine a look that will fit right in with surroundings which have a light coloured wood theme. 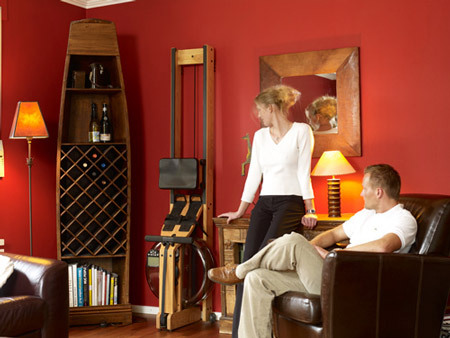 Like most of the WaterRower products it can be stored upright on its secure base against a wall or can be wheeled in a corner. We were actually surprised how light it was and how easily you could lift it on its end. So the Natural wins points straight away on style and storage. We initially wondered about how well a real wood rowing machine would perform, but straight away it was clear that the dual rail system and Danish oil finish gave the user a solid base and smooth sliding motion. Although the S4 looks the part in a home setting it can also look great in premium gyms and hence, comes with a commercial warranty. The thing you notice straight away when you start rowing if you have used a chain driven machine like a Concept2 before is that the rowing motion on the WaterRower is incredibly quiet and smooth. Combined with the use of the WaterRower signature 'real water flywheel', we struggle to see how much more realistic a rowing machine could be! The sound created by the water flywheel is minimal especially once you find yourself rowing at a constant pace. We could actually imagine quite a lot of people would find the noise of the water quite therapeutic. Other features on the WaterRower Natural are the fully adjustable foot straps that allow you to raise the height at which your feet are secured to the base of the machine, a necessary feature which is present on almost all rowing machines. 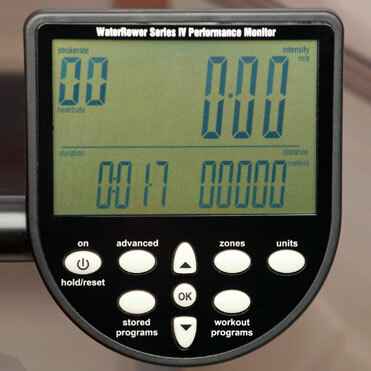 The rowing machine display comes in the form of a Series 4 Performance Monitor. This display has the functionality to show the user measurements of time, distance, speed, stroke rate and heart rate (with the option of connecting a sensor). The S4 computer also has the advanced capabilities to display time and distance projections, store programmes and zone workouts. At £949.00, this machine is great value compared to some of the other models of rowing machine available for a similar price. Even if having a machine that blends in with your furniture or the decor of your gym doesn't feature in your decision making process, we urge you to still consider the Natural S4, because it more than competes on performance as well. This entry was posted in Knowledge & Advice, Product Reviews on 14th February, 2014 by Colin Evans.